I know I´m coming up with this article extremely late scheduled but what happened is, that I was scrolling for my video blog and I was sure I deleted it and couldn´t restore it. 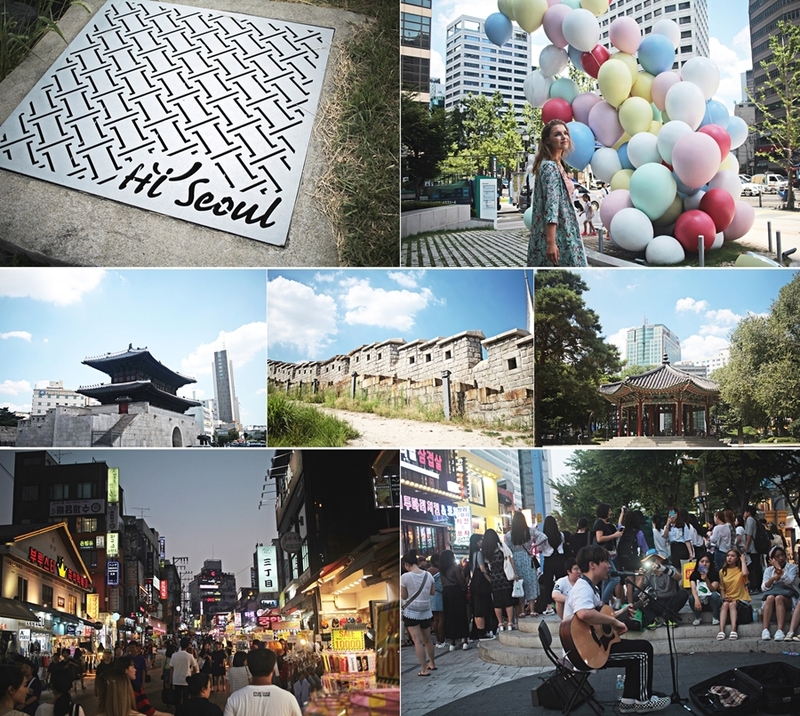 Just this morning, when I tried to edit a new video of the left-over clips, I finally found my video to share along with this article and so I also couldn´t wait to share my travel diary..
First of all, I must say I was really surprised about South Korea generally. I knew most of what I actually knew of the country only from some K drama and some other Korean entertainment. Summed up that´s most of what I actually knew at all. With its super famous boy group BTS and other stars, the country is well known for its entertainment business, Korean beauty and its neighbor North Korea as a strong opposite compared to the freedom and creativity we see in South Korea. As there are excellent flight options from and to Japan, I combined my Japan travels with a one-week trip to Seoul and Busan. 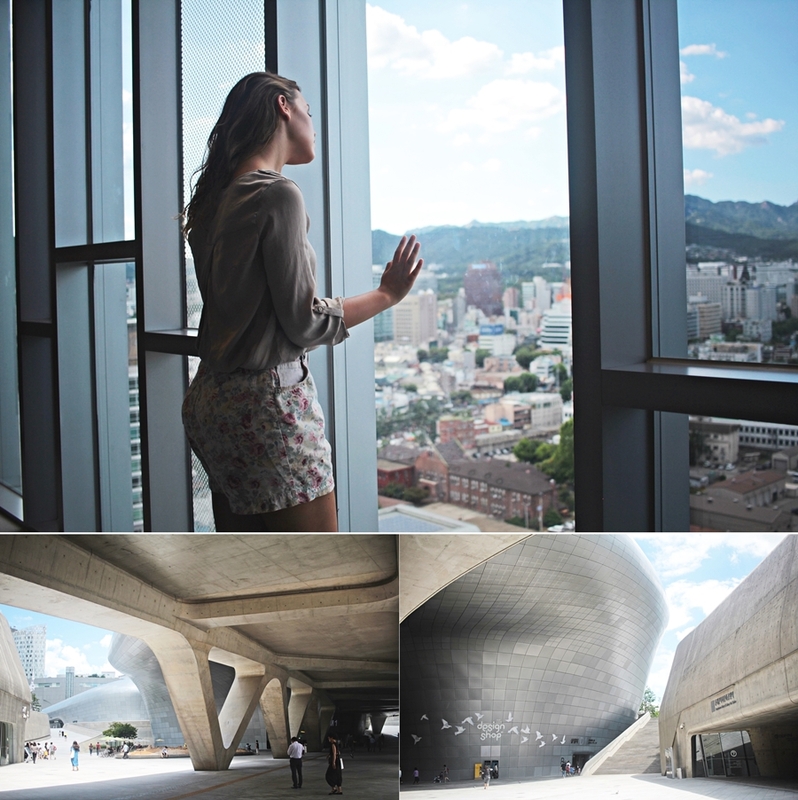 I spent most of my time in Seoul and actually loved it. My trip started in Dongdaemun and the first thing I saw when I arrived from the airport was the Dongdaemun History & Culture Park, which was super close to my hotel and basically just fascinated me with its super urban and modern shape. It is a great photo spot and just next to a train station. I definitely recommend to stop by, as there are also many other things to do nearby, just as the Dongdaemun Market with lots of street food and also the Seoul city wall, which is even more impressive in the night time, so as temples and many, many, shops. Seoul itself is extremely photogenic and one can take photos at temples, sky scrapers, modern buildings, touristic corners like shopping streets or just somewhere in the middle of the night, as the colorful billboards will make any photo a great snap anyways. For some photo and mingling with locals make sure to visit the famous Hongik University street, where people perform dancing and singing in the middle of a shopping street. It´s super fun to watch the performances, which are brought to you by individual talents who are trying to be spotted by society. The most famous shopping street in Seoul is however Myeong-dong, which is especially for those who are watching out for K beauty. One can basically find anything that is related to beauty products but as you might know, touristic spots always have a little addition when it comes to prices so make sure to find a good deal and do some research. Besides beauty, one can also find a lot of other shops, so as the line friends shop, which I recommend for some cute photos with the icons and super-sized teddy bears. Myeong-dong also offers street foods, such as a 32cm soft ice cream and other kind of shops and sometimes also really good deals in clothes. K pop fans will discover many shops which sell all kind of stuff of their idols. Seoul also has a “love” sign and the I Seoul U sign, which symbolizes the connection between locals and foreigners and makes one a part of Seoul. It is located at the han river, which can be a nice chill out spot during sizzling summer days as it´s connected with a smaller park area. As multiple times mention by now, South Korea is super proud of its entertainment system, that’s why you can still find things like the Seoul Gangnam statue, which was probably everyone’s first encounter with South Korea, just when PSY released this crazy single years ago. Moreover, one can stop by at the Hallyu K-Star Road, where one can take a photo with a statue of their favorite K-Star (group). By the way, there are also a lot of gardens and parks in Seoul, just as the Tapgol Park. Taking the trains is very easy and EXREMELY cheap. I recommend getting a plastic card at the airport, which one can recharge multiple times. The card is valid all-over South Korea for all kind of payments in shops, trains and more. That way one saves time and simply has to tap when entering the stations. As I also stayed in a hotel in Seoul dragon city, I would recommend that are to you. Seoul dragon city is a hotel complex by Accor hotels and one has many rooftops, pools and cool DJ parties to kick off an unforgettable holiday. It also allowed spectacular views above the city. Generally, what I always do when traveling, is walking a lot. I enjoy it far more than just always taking the train. Seoul is great for just walking around and felt save to me, as I even walked during the night times. There is probably a lot more to report or write about my trip but honestly I think this is some of the best of. I will for sure come back to see more. After a superb time in Seoul, I spent 3 nights in Busan, before going back to Japan. I decided to take the bus from Seoul to Busan. The Intercity bus cheap, has one stop and some splendid views of different cities any landscapes. While there are also many other ways to travel to Busan and also direct busses, I decided for a cheaper version. The busses are super comfortable, come with power for recharging devices and have a TV. The price is low, and I would always prefer the bus instead of taking the train which is a lot more expensive but half the time. The bus price changes depending on the time. Morning and evening busses are the cheapest, but the busses are usually not that crowded. My trip to Busan was spontaneous but I was so happy that I went to Busan, as I liked it almost a little more than Seoul. I was staying at the ibis style city center when I visited Busan and it was just the perfect spot for everything. I went to the harbor and discovered some wonderful and inspiring 3d art, where I took so many photos and videos. I also made it to the Haeundae Beach, which I accessed with a bus that was leaving in front my hotel. There are many other beaches and more things a little bit outside of Busan that I want to do next time, but even sticking with this beach was fun and I spent one entire day of my trip to Busan only at the beach. I also walked through the Gamcheon Culture Village which small streets, colorful houses and some funny people that I met along the way. It is something that I would recommend when one is the are of interested in houses but besides walking up and down the steep streets there is not too much to do. Although I enjoyed it for a walk and some cute photo shoots. During the night I went to the Seomyeon Underground Shopping Center and the BIFF Square, which is the most crowded street in Busan and generally one of the most crowded streets in South Korea. Even though one might imagine it a little bit unpleasant I must admit I had a lot of fun. Last part of this travel guide are the hotels that I was staying at. I was supported by Accor hotels during my travels in South Korea and stayed at different neighborhoods all over Seoul, while I was staying at only one hotel during my trip in Busan, coming from the brief time that I spent in the city itself. I hope you enjoyed this post and got some inspiration and information for your next trip. I was not paid to publish these information. These are photos and impressions of my private travels in Seoul and Busan that I share for others to help them when traveling in South Korea.